Research using temperature sensitive samples is estimated to be worth billions of dollars, can you give me a brief outline of the importance of ultra-low temperature (ULT) sample storage to this industry? The global biopreservation market was valued at $2 billion in 2015 and is expected to reach $3.7B US by 2020. Z-SC1 is operating in the biopreservation equipment segment of this market, especially dealing with mechanical freezers. This segment accounts for $400 million and ~15 manufacturers are actively involved in this market, some of them with great initiatives. However, two key players eclipse the rest, representing more than 65% of this market, dominating the with their brand alone. Scientists depend on the ability of the manufacturer to maintain the quality and integrity of their samples through highly reliable cold-storage equipment, which enables the samples to be maintained below the required temperature at all times. However, frequent freezer failures are a concern for researchers, affecting their ability to focus on their research. In the event of a freezer failure, scientists have to find space in other freezers to preserve their samples. When a freezer fails during non-working hours, both facilities staff and researchers have to come to the facility to handle the issue. If it is not possible to address the failure in time, the freezer contents, such as critical research samples or products, are lost. When a cold-storage unit fails, not only are the samples compromised, but also a substantial financial loss and years of researchers’ time and effort. Unfortunately, no manufacturer was able to solve this problem, but here at Z-SC1 we have addressed these issues to provide the safest ULT freezer on the market. What features do the Z-SC1 ULT freezers use to ensure safety of samples? Z-SC1 Biomedical is a different kind of company adapted to the 21st century and continuously upgrading its technology based on the feedback from lab managers and researchers. Since safety is paramount for ultralow (-80°C) temperature storage, Z-SC1 Biomedical has designed the TwinCore™ with high safety features. 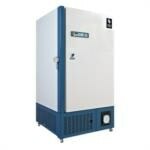 Z-SC1 Biomedical developed two completely independent refrigeration systems, each with a compressor capable of maintaining -82°C in the rare event of a system failure. Samples now have a redundant backup freezer within a freezer. However, even that breakthrough design was not enough for the company to feel really safe, and therefore we developed a free of charge monitoring system. The WiZBox™, can monitor 26 different parameters of an ULT's health to predict failure months before it would occur. Finally, even in an emergency power loss, it takes 11.5 hours for the TwinCore™ to climb from -80°C to -20°C, thus providing users ample time to respond. When all 4 interior doors are held open for 2 minutes on an empty freezer, the TwinCore™ recovers to -80°C in only 46 minutes, more than 3x times faster than any other ULT freezers. Why did you decide to provide redundant cooling systems in your freezers? What other systems are used in the industry, and how do they compare? Exploring the competition’s battle plan is always a good way to try and understand a different opinion or foreign point of view. The significance of cold-storage can be understood from the failure of a freezer holding brain samples collected for autism research at the Harvard Brain Tissue Resource Center (HBTRC) at McLean Hospital in Belmont, Massachusetts. Unfortunately, the failure was noticed too late to prevent the brain samples from thawing. Nearly a quarter of the samples preserved for the study and 14 years of research work were lost. This one event is one of only a handful that have been widely covered in the media, but there have been many such incidents over the years. Every single researcher might have experienced freezer failure in their career. The failure of the cascade refrigeration technology to provide security has resulted in billions of dollar in losses over the previous decades. Many researchers store their samples across multiple freezers as a precautionary measure against such failures, which is not required now. Other than the old cascade type system, there is a new technique that uses a stirling-based piston system. Although the technique is sound in principle, it does not offer any security at all and emphasizes energy savings over sample security. It may be a strategic move or for marketing purposes, but the value of the energy saved is $60 per year as opposed to an average value of $75K per year for a freezer’s contents. For us the choice of what is more important is clear. Does having two independent and separate refrigeration systems impact the energy efficiency of the freezers? If so by how much? The use of two independent and separate refrigeration systems affects the energy efficiency of the freezers because operating two compressors requires some extra energy. However, if the pull down is 3x shorter, the energy used will be 3x less than other systems requiring around a full day to get from room temperature to a set point. Conversely, the TwinCore™ takes only three hours. Then it switches to one compressor when on pace, and the energy used is one of the lowest in the industry. Therefore, the TwinCore™ is indeed super-efficient in terms of energy efficiency. How does that affect their running costs? How does this compare to the potential loss of samples? Giving emphasis to energy saving and running costs is meaningless, when the cost of the ULT Freezers is more than $10,000 and the average value of the freezer content is $75K, with some freezers containing content worth more than $1 million. Paying attention to $60 in savings per year per freezer is pointless. If people believe that energy-efficient ULT Freezers will keep their valuable samples from risk of loss, then they are lucky enough to have not lost a sample yet. 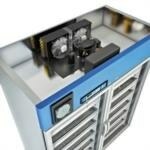 The TwinCore™ ULTs are the only units that offer total sample security without any failure and sample loss, ultimately leading to cost savings and increased completion of valuable research. Can you give me a brief overview of the WiZBox? What added features does this add to the ULT freezer system? With the WiZBox, we wanted to increase sample security using new technology to support our ULT freezers. 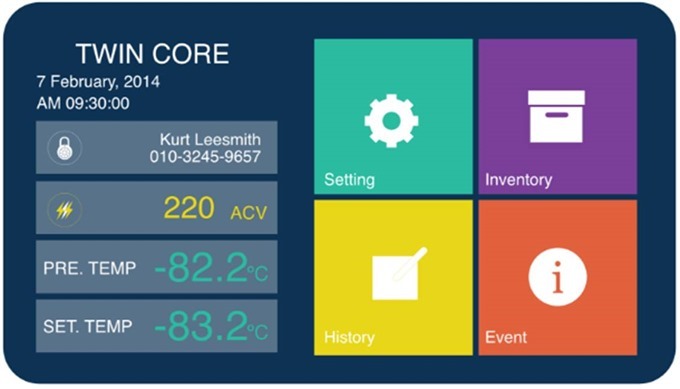 The answer lies in integrating the internal system diagnostics with accessible software via Android phone and computer, displaying mechanical refrigeration parameters typically checked by field technicians. Z-SC1 Biomedical’s goal was to improve the service life of laboratory equipment. With the WiZBox, ULTs can be transformed into a smart machine and TWINCORE ULT marks the birth of a SMART-ULT. Z-SC1 Biomedical’s WiZbox is a unique proactive maintenance device. This new and innovative accessory allows your freezers to be backed up with a 24/7 preventive maintenance strategy in order to stabilize the reliability of the equipment. The ultimate goal is to overcome any failures and improve equipment uptime. Z-SC1 Biomedical designed the WiZbox to check the overall health of the freezers. Via a web interface, all data is transmitted back to the Z-SC1 server round-the-clock all through the year. Are you planning to add any extra features to your ULT freezers? Z-SC1 Biomedical has plans to integrate Virtual Reality into its systems to provide, for instance, VR On site servicing, or VR remote monitoring with its WiZbox. What does the future hold for Z-SC1? A company can acquire other companies to expand its product range and respond to a market need, for instance, the biopreservation. Z-SC1 Biomedical’s plan goes more in this direction. Z-SC1 Biomedical’s website is the ideal place to get information, but social media such as Facebook or LinkedIn are great to get the latest news. 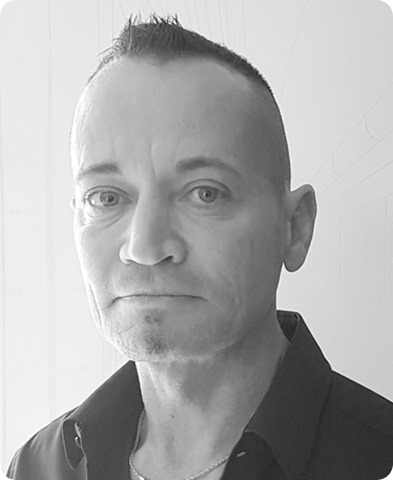 Jean is the CEO of Z-SC1 Corporation Group, based in Westmount, Canada, producing biomedical freezers that don’t compromise on sample security. A leader less interested in corporate hierarchies, and more in building meaningful relationships with our clients, partners and, the communities in which we live and work. An expert in strategic planning, operations, investment management, and Marketing, with over 20 years as an experienced executive focused on technology products for the sciences business. A specialist in achieving strategic objectives with the primary focus on increasing shareholders’ wealth thru merger, acquisition, new business developments, or undertaking share offering and raising capital. We have a 20-year track record as experts in the Biomedical field, with a passion for engineering energy-efficient laboratory equipment. Our powerful combination of expertise and dedication drives our pioneering efforts to create uniquely-inspired equipment.